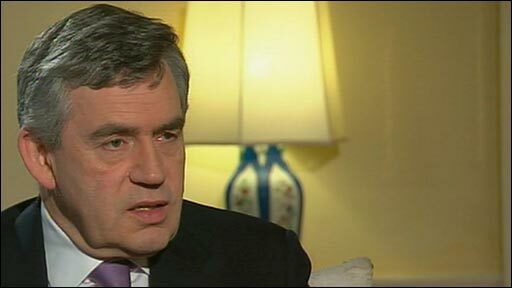 Gordon Brown has refused to comment on reports the government will cut VAT by 2.5% as part of an emergency package aimed at kick-starting the economy. But the PM said "substantial" measures would be in the pre-Budget report on Monday to pump money into the economy. And he denied increasing borrowing to fund tax cuts was a "gamble", saying it was "responsible and necessary". 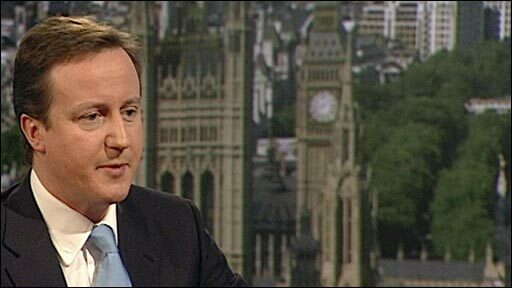 Tory leader David Cameron has warned the government's plans will lead to a future "tax bombshell". Mr Brown refused to speculate on the contents of Chancellor Alistair Darling's statement on Monday, but he said there was a consensus around the world that any "fiscal stimulus" had to be "substantial to have an impact". Experts say the government will have to increase borrowing to record levels of £100bn or more, which the country will have to pay back later in higher taxes - and there is no guarantee tax cuts will get consumers spending again. But Mr Brown told BBC One's The Politics Show: "I don't see this as a gamble, I see this as necessary, responsible action, that any sensible government would want to take. "Those people who say do nothing now, would leave people, as in the 1980s and 1990s, without hope that their mortgage problems could be sorted out, or their jobs problems could be sorted out. "It would be lacking in compassion, as well as irresponsible, in my view." Pressed on whether Mr Darling would also be setting out details of future tax rises on Monday, Mr Brown said: "I think you'll find that everything is above board. It is stated. There is no hidden manifesto. People will be absolutely clear that we are taking action now to prevent permanent damage later." He refused to be drawn on reports he is considering a summer general election to capitalise on his improved fortunes in the polls. He said his "undivided attention" was on fixing the economy. Widespread press reports suggest Mr Darling will temporarily cut VAT by 2.5% to 15% - the lowest level allowed under EU law - in an effort to boost consumer spending. However, it is not known if the cut would come into effect before Christmas as some newspapers have suggested. It would be the first time the sales tax has been changed since the early 1990s, when the Conservatives increased it to 17.5%. Taken together with other planned giveaways, it would mark the biggest shift in Labour's economic policy since it came to power in 1997. Earlier, business secretary Lord Mandelson conceded any tax cuts would have to be paid for in the long term, saying: "Of course they will, if what we are going to do tomorrow (Monday) is going to be sustainable." But he said action was needed now to deliver the sort of stimulus necessary to raise demand, "filling up order books again". Conservative leader David Cameron said he was "sceptical" that the government's plan would get consumers spending because they would be aware of the "tax bombshell" they face in future years to repay the national debt. He said: "I think people are going to be shocked tomorrow (Monday) when they see the extent of government borrowing. "Maybe £80bn this year, before the recession's even properly started, and possibly over £100bn next year. And next year that is over £4,000 extra for every family in the country. "So I do have a real concern about a government going on a borrowing binge that even they are now admitting is going to lead to much higher taxes later." The Conservative leader called for further interest rate cuts and government guarantees for loans to small firms in an effort to help homeowners and businesses. 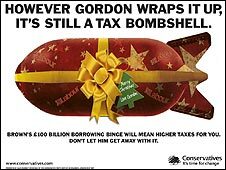 The party has resurrected its successful advertising campaign from the 1992 general election to warn voters they face a "tax bombshell" to pay for Mr Brown's economic rescue package. Lib Dem treasury spokesman Vince Cable said his party backed tax cuts for low and middle income workers, but said they should be made permanent by increasing taxes on the rich. He said: "A big tax cut's desirable, that's certainly the case. And a VAT cut would act very quickly, which is positive. "But we prefer a different approach which is more targeted on people who really need it. And we believe that people on low incomes, low wages should get an income tax cut - lifting thresholds or reducing the rate. And that's a much better way of concentrating resources where it needs it. "And it would also be sustainable because we've identified how you would pay for it. It wouldn't just be a temporary handout."